Highly advanced non-invasive medical device that effectively resolves challenging face and body aesthetic needs, such as non-surgical body contouring, cellulite reduction, skin tightening, and wrinkle reduction. This revolutionary 4D technology can be applied to many different parts of the body such as the face, neck, abdomen, love handles, back, hips and thighs. It firms and tightens the targeted area; resulting in improvement in skin texture and fine lines. Concurrently, it burns fat to result in circumferential reduction. The Venus Legacy is a non-invasive, comfortable with no surgery involved and zero downtime. Daily activities can be resumed after treatment. How does Venus Legacy work on both face and body? Face – It combine the use of Multi-Polar Radio Frequency and Pulsed Electro Magnetic Fields. Radio frequency when applied to the skin produces thermal reaction beneath the skin at a targeted depth within the tissue. This stimulates the body’s natural collagen production process. 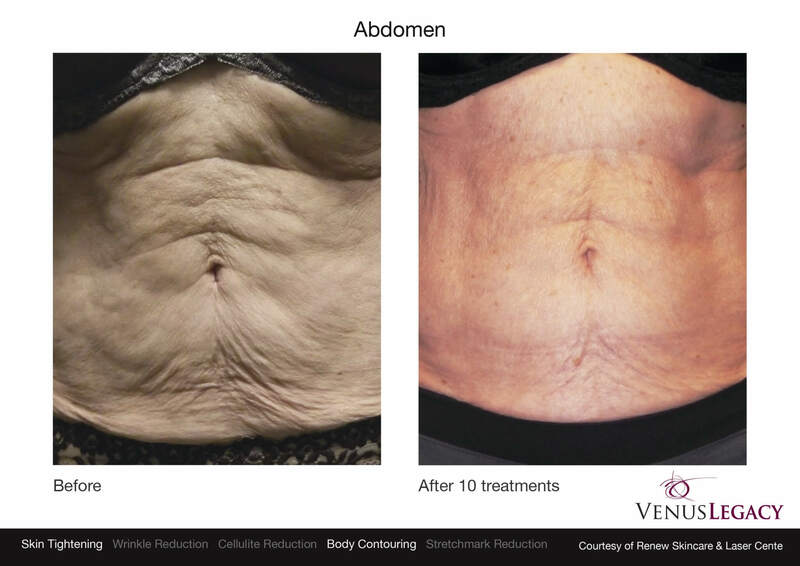 Every treatment, the Venus Legacy works to increase collagen and elastin fibre production over the treated areas. This helps to tighten, lift and improve the quality of the skin such as fine lines and wrinkles. Body – The patented Venus Legacy Vari- pulse technology creates a gentle massage and suction effect. This action gently pulls the skin upwards toward the applicator head to allow for deeper penetration of the radio frequency energy into the skin. This mechanism enhances body contouring, helps to reduce cellulite and improves lymphatic drainage. In addition, the thermal energy generated from the Venus Legacy treatment targets fat cells. This helps to contour and slim targeted areas through desired circumferential reduction. Is it safe? How does it feel like? The Venus Legacy is a safe, zero downtime treatment. The real-time thermal feedback ensures that the treated tissue area always stays within control temperature range. This ensures the safety of the treatment and maximal efficacy. It is a comfortable treatment and feels like a soothing, heated massage. Each treatment session takes approximately 30 minutes per area and most patients will require 6-8 sessions per targeted area, once a week. The number of sessions required may vary from patient to patient, depending on the treating area. Maintenance sessions thereafter can be done every 1-2 monthly as desired. Am I suitable for the Venus Legacy treatment? The Venus Legacy treatment can target unwanted fat bulges, loose skin and cellulite. It is an ideal treatment to improve post pregnancy body. It reduces unwanted bulges, tighten and firm up saggy skin. The Vari-pulse technology also helps in lymphatic drainage and improves blood circulation. The treatment also improves the textural qualities of the facial skin, reducing fine lines and significantly restoring the youth.